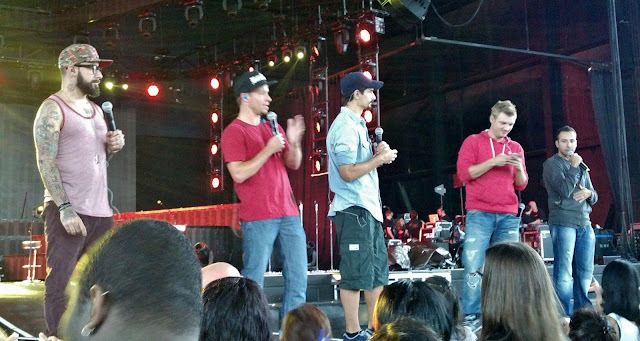 love, elizabethany: interview with the backstreet boys, and more from their show! interview with the backstreet boys, and more from their show! I've been working every contact I know for the past two months trying to get them on the show or a chance to sit down with one of them backstage, and while neither of those things happened, I'm pumped that I was able to go to their soundcheck party before the show. The Boys were all really cool. Even if they had their pro-faces/best behavior goin' on, they were exactly as they've always seemed. Brian was so goofy he was borderline-clown. Nick was definitely the little brother of them all. Kevin was the grown-up, trying to be cool sometimes guy. AJ was just a normal person who likes to have a good time. Howie was the one I couldn't figure out as much. If there's any of them that I wasn't in love with, it was him. He seemed a little too cool with some comments. I asked them what their biggest fashion regrets of the 90s were. I didn't catch the part where Nick talks about his out of control hair and overalls, but he said he lost a lot of fans that day. [We would never hate on such a look!] Another girl asked them what their stripper names and moves would be if they were in Magic Mike. Golden. I don't have any good videos of the performance, but there's a thing called YouTube where you can see other videos of it. Real neat. They probably have the best father/son relationship... gah. Watching Brian dance and get all excited on the side was just awesome. As for Jesse McCartney, he's still got it.. and after hearing some of his new stuff, I'm really hoping for a comeback! He's totally transitioned into the adult, Robin Thicke meets cooler Justin Bieber vibe. Like... I just can't believe this happened. 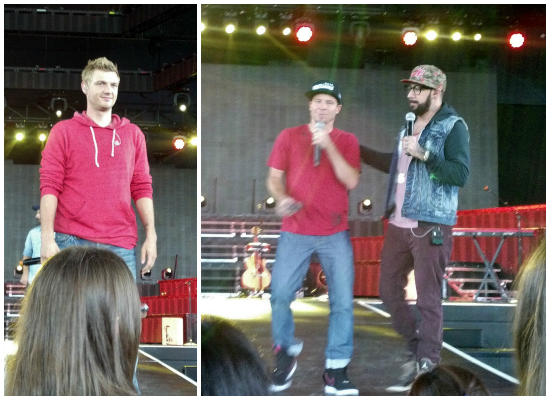 I met the Backstreet Boys. If you would have told me this would happen fifteen years ago I would have freaked out so hard my brain would be misaligned or something. Wow. If you're in a city where you can still catch the show, do it! You'll love it. Every second of it [even Pauly D] was so fun. And if you can, buy the $75 tickets for the after party. You'll get to hang with the Boys and dance and it sounds like it's super worth it.